When I worked at the patisserie, I once slipped and fell in the freezer room because the floors were wet from a defrost. But I was also carrying two full sheets of tiramisu in my hands and just like a pancake or egg that's flipped midair whilst cooking, this was similar but with a more unsuccessful outcome. The pan inverted midair and the cake released with all its mascarpone and fell all over my face. I cleaned up and continued to work for the rest of the day but the smell and texture stayed with me. I haven't eaten tiramisu ever since, one day I will go back, I promise! There are times when I want to spend more time on the cake and little time on the frosting. There are times when I crave a buttercream frosting and other times when I crave something a little less delicate like a mascarpone based one. Here is one of my favorite ways to use mascarpone and this is a good frosting that works with cakes that aren't too heavy (if your cakes in the layers are heavy, they will squeeze the frosting out so instead use less frosting in the sandwich but add a little more on top) . Whisk all the ingredients together in a medium bowl until combined and smooth (there should be no lumps) and use as needed. The frosting tastes best the day it is made but will last for up to 3 days in airtight container in the refrigerator. Disclaimer: This post was sponsored by Vermont Creamery. However all opinions expressed are solely my own. The South is famous for many wonderful culinary delights but in summer I'm always reminded of all the peaches we eat when we visit M's parents at the farm. Big, fat juicy peaches where the sweet nectar trickles down your arms and the mess is irrelevant. And then there's bourbon, which I truly think was somehow solely created to go with peaches. Peaches first landed in Virginia somewhere in the 17th century and quickly spread their way across the South. Since Georgia is known for peaches, I thought Georgia is probably the largest producer of the fruit but it turns out, California grows the largest amount of peaches each year. (This actually surprised me because for some reason, California didn't even come to mind). Peaches have finally arrived at my farmer's market in Oakland. I ate 6 in one sitting on the first day, I think another 5 on the second, I can't help myself. These cupcakes are made with olive oil and peaches and then frosted with a peach and olive oil based frosting. But the cupcakes are also spiced with a little cardamom, star anise and cloves to complement the peaches. I usually like to spread a spoonful of the frosting on the surface of the cake and finish it with walnut (pecans work well too). Oh yeah and I cheated a little on chopping my peaches, I used my blender to get a little bit of the juice out so it blends in with the cake batter too. Here, I've used California Olive Ranch's olive oil which has delicious fruity notes that stand out in the frosting and in the cupcakes. Place a wire rack at midlevel and preheat the oven to 350F. Line 2 (12 capacity) standard cupcake pans with paper liners. Grind the cardamom, cloves and star anise using a mortar and pestle or a spice mill. Sift the ground spices with the ginger, flour, baking powder, baking soda, and salt in a large bowl. In a separate bowl, whisk the olive oil and sugar by hand. Then add one egg at a time and whisk until combined. The mixture should be pale yellow. Whisk in the peach liqueur and the bourbon. Whisk this mixture into the sifted dry ingredients and then fold in the peaches. Divide the mixture equally between 16 cupcake molds and bake in the preheated oven for about 12 to 15 minutes until the cakes are firm in the center and light golden brown, rotating the pan halfway through baking. Remove the pan from the oven and allow the cakes to cool in the pan on a wire rack to room temperature. To prepare the frosting, stir the confectioner's sugar, oil, peach liqueur, bourbon and water to form a smooth paste. Add more water if needed. To frost the cakes, you can either dip a cooled cupcake and rotate to coat the surface in a thin even layer and allow to sit on a wire rack to set. Alternatively, spread 1 to 2 tsp of the frosting on the surface and spread using an offset spatula. Place a walnut half in the center. Allow the frosting to set for about 20 minutes. The cakes should last for 3 to 4 days. *You can also put the peaches in a blender and pulse for a second or two until you get a little bit of the juice extracted out and add that to the batter. Just don't make a purée! An extra tip, here, reserve 1 to 2 Tbsp of the juice and stir that into the frosting. Disclaimer: This post was sponsored by California Olive Ranch. However, all opinions expressed are solely my own. My friend Justin recently sent me a meme joking about how the rest of the country celebrates fall while we in California don't. We do, it's just a little late. Some trees will shed their leaves and the temperatures are relatively warmer but it's still autumn. My pomegranate and fig trees will shed their leaves soon and I will anxiously wait for them to breathe back to life next year but till then I will indulge and immerse myself in seasonal pies and flavors. And then there are pomegranates! Pomegranates are one of the most beautiful fruits to behold during a season that's usually enveloped in shades of yellow to brown. This pink fruit stands out in every way possible. The perfect balance of color, sweet and tartness enclosed in a ball. This layer cake is my ode to the pomegranate. It draws inspiration from the Mediterranean, the Middle East and the South, it's a cake as diverse as its flavors. Sticky sweet pomegranate molasses in crème fraîche, a cinnamon sponge cake made with crème fraîche and a simple syrup of honey bourbon to flavor the cake. This sponge cake is made with whole-wheat pastry flour from Bob’s Red Mill's . It's probably one of the best whole-grain pastry flour mixes I've baked with because it's light and the gluten content is low enough to work with in cakes and pastries, and the resulting cake texture it produces is always impeccable and delicate just like it did in this cake. In this genoise sponge cake, folding the dry ingredients into the wet ingredients will cause some deflation of the foam, be quick and fold carefully but don't worry if you lose a little volume. When adding the pomegranate molasses to the crème fraîche, taste and adjust the amount as needed since it is a sweet yet tart liquid with a lot of flavor packed into a tiny spoonful. I recommend keeping this cake in the refrigerator if you can't finish it up the day of, since the acidity of the pomegranate molasses can break down the crème fraîche over time. If you have access to Brazilian Pinga Com Mel then try and flavor your cake with that versus honey bourbon. It's a honey based alcohol which is delicious!!! 1. Place a wire rack at midlevel in the oven and preheat to 350F. Line two 9 inch round cake pans with parchment paper and keep aside. 2. Sift together the flour, baking powder, cinnamon and salt three times in a large mixing bowl. Set aside. 3. Using the whip attachment whisk the eggs in the bowl of a stand mixer at medium-high speed for about 5 minutes. Then in a slow steady stream pour the sugar from the side of the bowl while continuing to whisk the eggs for about 5 to 6 minutes until the eggs turn pale yellow in color and the entire mixture gets thick in consistency. 4. Remove the bowl from the mixer and sift 1/3 of the flour mixture over the eggs and fold with an outward to inward motion using a silicone spatula. Then fold 1/2 of the whipped crème fraîche. Repeat and fold in 1/3 flour and remaining crème fraîche. Fold in the remaining flour and divide and transfer the batter equally to the prepared cake pans. Place the pans in the preheated oven and bake for 45 to 50 minutes until golden brown and firm to touch. Remove from oven and allow the cakes to cool in the pan for 5 to 6 minutes, then run a pairing knife between the edges of the cake and the pan and transfer the cakes to a wire rack to cool completely before frosting. At this point you can also wrap the cakes with cling film and freeze for up to a month before using. 1. Mix the simple syrup and honey bourbon together in a small saucepan and bring the contents of the pan to a gentle simmer and cook for 2 minutes with occasional stirring. Remove from stove and transfer to a container and refrigerate to chill before use. 1. In a medium-sized mixing bowl on ice, whisk all the ingredients for about 2 to 3 minutes until firm peaks form. Take one cooled cake and place on a cake stand. Spray/brush the surface of the cake generously with the bourbon syrup. Place half of the pomegranate crème fraîche mixture and spread to cover the surface of the cake with an offset spatula. Place the second cake over the frosted cake and repeat. Garnish with pomegranate arils and dust with cinnamon. Allow the cake to rest for about 20 minutes before serving. This cake will last for a day or two. Disclaimer: This post is sponsored by Bob's Red Mill, however all opinions expressed are solely my own. As some of you know, I visited New Orleans recently and ate a lot of food. Southern food is as charming as the sweet folk that have cooked those dishes for years, they are special and comforting and in many ways envelopes you like a warm hug of love. That’s how I feel everytime I’m down in the South visiting. Grits are one of the most comforting textures you can feel on your tongue, it reminds me of semolina porridge that I ate in India at breakfast. As an ode to the South, I’ve created this dessert made with sweet grits. On this bed of sweet grits sits the most delicious and aromatic batch of figs infused with Pernod Classic and tangerines. It’s the right combination of fruity sweetness and floral flavors to accompany something as delicious of the texture of grits. It’s best to start with dried figs than fresh figs for this particular recipe because they will act like a sponge and absorb the flavors in the tangerine and the versatile star anise and herbs of the Pernod Classic. It’s infusion at its best! It’s infusion at its best! You can use any type of dried figs, dark, golden, they will all work well in this combination, just make sure they’re dry. I like the taste of tangerine juice versus regular orange juice here but if it’s difficult to find you can substitute orange juice. I’ve also served these figs as is without grits. It makes a tasty addition to a cheese tray and can be served warm or cold. Add all the ingredients from the milk to the salt in a medium-sized saucepan and bring it to a boil. Reduce heat to medium-low and slowly stir the grits into the liquid and mix evenly. Increase the heat to medium-high and bring the contents of the saucepan to a boil. Cover the saucepan with a lid, reduce heat and cook for about 25 to 30 minutes until creamy smooth. Add a little more milk if necessary but the grits when soft and creamy like a thick porridge. Keep warm until ready to serve. Place all the ingredients in a small saucepan and bring to a boil. Reduce the heat to medium-high and allow to cook until most of the liquid has evaporated and a thick sauce is left behind. This should take about 20 minutes. Continue to cook until the sauce starts to caramelize, stirring to coat the figs evenly. The sauce will be dark orange in color. if the sauce gets too thick, you can add a tablespoon or two of water and to thin the sauce. Remove from stove and keep warm. To serve, divide the grits equally between two individual serving bowls. Top each bowl of grits with half of the caramelized figs and serve warm. Disclaimer: This post was sponsored by Pernod Classic. All opinions expressed are solely my own. I absolutely love it when my friend's cookbooks come out and the pastry/dessert ones take a special place in my heart. A couple of months ago, I shared a quatro leches recipe from Sam's book which is now nominated for a James Beard award! Sam does an amazing job of bringing spices into desserts and she does that with finesse. Congrats, Sam! Now another dear friend from New York, Yossy of the blog Apt. 2B Baking Co. has a new dessert cookbook out called Sweeter off the Vine! Yossy deals with desserts in her own special and unique way, she passionately infuses flavors from her life into each and every treat listed in her book. The lemon verbena olive oil cake, the mint infused ice cream with cacao nibs, the blood orange old-fashioned donuts, the apricot berry galette with saffron sugar are just some of the delicious recipes that are included in her book. 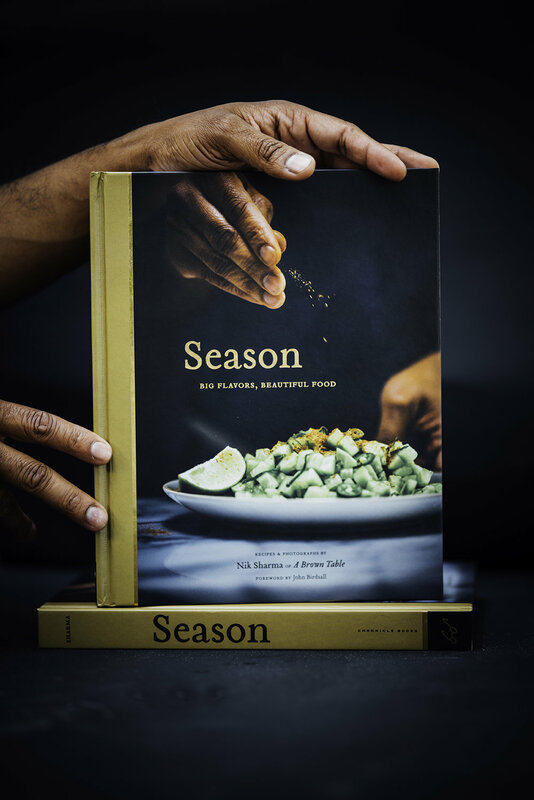 What makes this book special to me, is the way Yossy weaves a rich tapestry of her culture and life into each recipe, her Persian heritage, growing up in Seattle and her life in Brooklyn, it all comes together in the ingredients, flavors but it's Yossy's way and it's perfect! It's her amazing story and this book goes straight into my dessert/baking collection that will always be cherished for years to come. From its big floppy leaves, to its beautiful stalks, rhubarb is beautiful (and poisonous - the green parts) but it's a resilient plant to grow. It dies and comes back every spring. And if you love rhubarb, you will love this semifreddo from Yossy! It's creamy and smooth, and like a slab of marble with tiny flecks of roasted pink rhubarb stalks embedded in sweet frozen custard. Another winning feature, it's not too sweet and you can actually taste the flavor of the rhubarb. The distinct jammy flavor of rhubarb is not to be missed and I'm actually happy her recipe doesn't ask for mixing in strawberries, you can taste the rhubarb! She has quite a few serving options, from whipped cream, to pistachios, to a rhubarb compote (which I didn't prepare, the recipe is in her book), so many options that are all good! Though I intended to make her rhubarb compote, I ran out at the last minute and used some leftover lingonberry jam thinned out with a little hot water and a splash of bourbon. That's the beauty of Yossy's semifreddo and like many of the recipes in her book, she gives you a delicious recipe and you can enjoy it anyway you want to! In Yossy's own words here is her recipe! 1. Position a rack in the center of the oven and preheat to 375F. Line a 9X5X3 inch loaf pan with plastic wrap, making sure there are at least 3 inches of overhang on each side. 2. To roast the rhubarb: Slice the rhubarb stalks into 2-inch pieces and put them in a baking dish large enough to hold them in a single layer. Sprinkle 3/4 cup of the sugar and salt over the top and toss gently to combine. Bake for about 15 minutes, or until the rhubarb is soft and juicy. Let the rhubarb cool slightly, then transfer to a food processor or blender and blend until smooth. You should have 2 cups of rhubarb purée. Refrigerate while you prepare the rest of the ingredients. 3. Whip the eggs with an electric mixer on high speed with the remaining 1/4 cup sugar until the eggs are light in color and have nearly tripled in volume, about 7 minutes. In a separate bowl, with clean beaters, whip the cream to soft peaks. 4. Whisk the chilled rhubarb purée into the eggs until well combined. Don't worry if the eggs lose some volume. Fold in the whipped cream, then spread the mixture in the prepared pan, and smooth the surface. Fold the plastic wrap over the top to cover, pressing it against the surface to seal. Freeze until completely firm, at least 6 hours to overnight. 5. To serve: unwrap the plastic from the top of the pan, invert the semifreddo onto a platter, and remove the remaining plastic. Serve thick slices of semifreddo with a bit of whipped cream and chopped pistachios or a spoonful of jam/compote. Extra semifreddo can be stored in a freezer, wrapped tightly in plastic wrap, for up to 5 days. Reprinted with permission from Sweeter Off the Vine, by Yossy Arefi, copyright 2016, published by Ten Speed Press, an imprint of Penguin Random House LLC. I have some exciting news to share with you! If you've ever wanted to see me behind the scenes and see what goes on in my kitchen then you must watch this beautifully shot KQED/PBS documentary on my work. The documentary came out last week and was produced by Jessica Jones who is an extremely talented and gifted artist (you must check out all the other wonderful videos she's produced!). We bought spices from one of my favorite new spots, Oaktown Spice Shop where I got to hang out with the owner John Beaver who was super kind to let us use his space. Vanilla beans from Madagascar to Tahitian, large jars of spices in a gorgeous space that could make you swoon with envy. The shelves, the hutches, the jars, I could go on and on. Some of those spices made it to the pie (that's in the video) and others I plan on using soon. Most of the time when it comes to gluten-free baking, I tend to plan for disasters. You never how things will turn out or taste, the lack of gluten makes for a high-risk cake venture that could easily end up in the garbage. But thankfully with this new Baking flour mix from Bob's Red Mill, it's now much easier! Every trial with this cake recipe worked perfectly and the cake crumb is delicate and delicious. It takes the guess work out of gluten-free baking and it's now become a must when I have to bake gluten-free cakes for my friends who are sensitive and have dietary issues. This cake is a tea cake, if anything. And, if you like the scent of freshly toasted pistachios then you will love this cake. This baked cake once inverted has an almost speckled appearance with the toasted pistachios nestled in the cake. A little blood orange sauce on the side and you're good to go! Enjoy! Use fresh blood oranges when making the sauce, skip the bottled juice! If you like, you can serve the orange sauce on the side with the cake versus pouring it over the cake. 1. Place a wire rack at midlevel in the oven and preheat to 350F. Line and grease a 9 inch baking pan with a little butter. 2. Dry whisk the flour, baking powder, baking soda, and salt in a medium sized mixing bowl and keep aside until ready to use. 3. Beat the eggs and 1 cup of sugar using the paddle attachment in the bowl of a standmixer at medium speed for 4 to 5 minutes until the eggs are pale yellow. Add the butter and whisk for 1 to 2 minutes on medium speed until completely creamed. Add the pistachio extract and whisk for 10 seconds. Then stop the mixer and add half of the whisked dry ingredients. Mix on low speed until just combined, add the remaining dry ingredients and whisk until combined. 4. Sprinkle the chopped pistachios over the greased baking pan. Pour the cake batter over the pistachios in the pan and bake the cake in the preheated oven for 40 to 50 minutes rotating halfway through the baking process, until the center of the cake is firm to touch and springs back (or until a skewer comes out clean from the center of the cake when inserted). Remove the pan from the oven and allow the cake to cool completely on a wire rack before releasing it from the pan. Flip the cake over a serving dish/cake stand. 5. While the cake is cooling on the wire rack, prepare the blood orange sauce. Whisk the orange juice, sugar and cornstarch in a medium-sized mixing bowl. Heat on medium-high heat until it begins to thicken like a custard, this should take about 4 to 5 minutes. Remove from stove and allow to cool completely before serving. Drizzle the cake with the blood orange sauce before serving or serve the sauce on the side. Disclaimer: Thank you to Bob's Red Mill for sponsoring this post. All opinions expressed are solely my own.